Amid the ongoing Cambridge Analytica scandal, Facebook is firmly in the firing line for enabling the spread of disinformation on their platform. 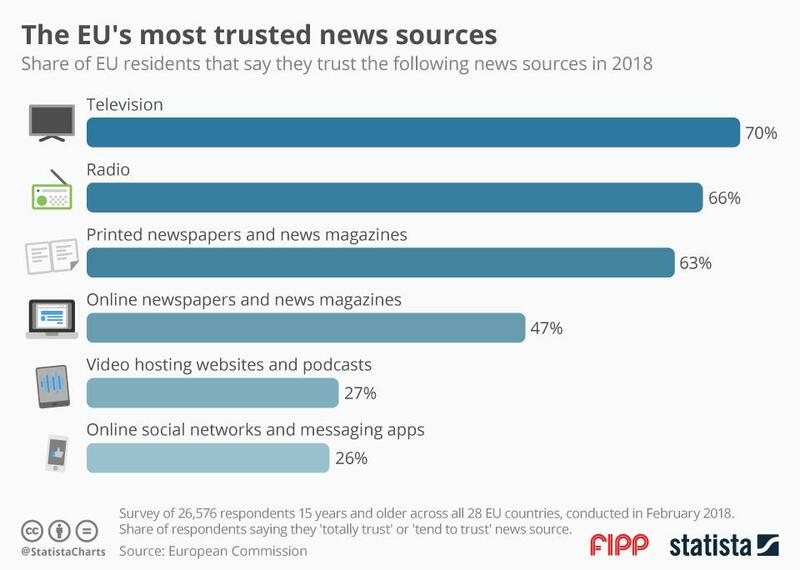 Indeed, when it comes to trust in news sources in the EU, a new survey by the European Commission has social networks and messaging apps firmly at the bottom. Only 26 per cent of respondents said they 'totally' or 'tend to' trust sites such as Facebook and Twitter when it comes to news. On the other end of the scale, news broadcast over the radio and televised news are still held in high regard, both are trusted to some degree by 70 and 66 per cent, respectively. The printed news sources aren't far behind with 63 per cent. These findings give legacy publishers and broadcasters an edge over new digital outlets that relay information and news without any trained gatekeepers to filter out the fake news.